This pull out shelf slide is designed for kitchen appliance drawers, pan shelves and entertainment center shelves. Features include full extension, clear zinc finish and a 100 lb weight capacity. 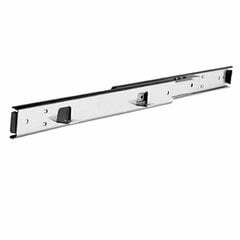 Accuride 322 Full Extension Shelf Slide 14"
Accuride 322 Full Extension Shelf Slide 16"
Accuride 322 Full Extension Shelf Slide 18"
Accuride 322 Full Extension Shelf Slide 20"
Accuride 322 Full Extension Shelf Slide 22"